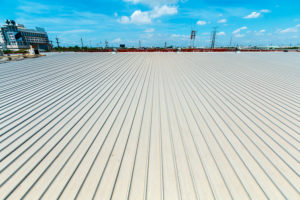 Having a metal roof coating applied to the roof of your commercial building in the Tampa, Florida, area could help prolong the life of your roof for many years while also reducing your roof maintenance costs. This can be especially important in the unforgiving Florida climate, which can quickly take a toll on an unprotected roof. The products we offer are designed to offer excellent durability, weather protection, and heat reflection. Once applied, roof coatings can result in fewer maintenance costs for your roof and the potential for reduced energy costs as well. That’s because your roof will absorb less heat, potentially decreasing the strain on the building’s HVAC system. This can also result in a more comfortable environment for the building’s occupants. Contact Elite Roofing Services today if you would like to learn more about the metal roof coating products we offer for businesses in the Tampa, FL, area. Also be sure to ask about our preventative roofing maintenance programs, which could help keep your roof in optimal condition.